Winter Escapades in NYC: Giveaway! by Robin Gorman Newman | MotherhoodLater.com - World’s leading website, eZine and community for midlife moms. Last December, when we stayed in the city during winter school break, we had mounds of snow, ice and slush to contend with. This time, fortunately, the streets were clear, and we stayed for two nights with our good friend Alli. We bunked at our favorite hotel, the comfy, artsy Roger Smith Hotel (details below) on 47th and Lexington, and enjoyed despite a painful knee injury I recently sustained. We had originally planned a three night stay, but cut it short due to my discomfort (Motrin, Arnica and a knee brace helped somewhat). I toughed it out since I didn’t want to disappoint Seth, otherwise I would have cancelled. The Roger Smith stay included a delicious, generous full American breakfast at Lily’s in the hotel, and Seth adored their steak and eggs, especially after sampling it and eating off of Alli’s plate. Day 1 included: A cab ride to TJ Maxx on 57th and 8th, my favorite TJ in the Big Apple. Just can’t resist! 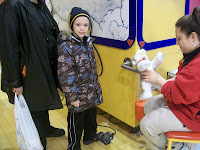 Seth waited anxiously for our visit to TOYS R US in Times Square, where Alli bought him a Playmobil Ambulance for Hanukkah. Following that and dinner, we went on THE RIDE (details below.) Always a total fun experience, we highly recommend it as a cool way to experience the city when you need to rest your feet….and in my case, perfect, given my injured knee. If you love pizza but always wanted to know more about its background, check out the pizza tours offered by Scott Wiener, a highly enthusiastic and knowledgeable tour guide and pizza guru. We signed up for the Greenwich Village Pizza Walk. We sampled three very different kinds of pizza, and learned about the history and evolution of pizza…including insight into everything from making mozzarella to gluten to oven temperature to crust texture to toppings, etc. Luckily there was plenty of sitting time at restaurants and local parks where we listened to Scott tell us about his love of pizza, etc. Build-A-Bear Workshop, Inc. is the leading and only global company that offers an interactive make-your-own stuffed animal retail-entertainment experience. Founded in 1997, the company currently operates more than 400 Build-A-Bear Workshop® stores worldwide, including company owned stores in the United States, Puerto Rico, Canada, the United Kingdom, Ireland and France, and franchise stores in Europe, Asia, Australia, Africa, and the Middle East. In 2007, the interactive experience was enhanced – all the way to CyBEAR® space – with the launch of buildabearville.com®, the company’s virtual world. We had a great time. Seth made a Yellow Lab named Goldy, and fell immediately in love. There is something for everyone here. And, the cutest, cleverest accessories and clothing for the wide array of stuffed animals you can make and see come to life. Check them out at http://www.facebook.com/buildabear to stay abreast of the most current promotions and receive exclusive offers. NOTE: BUILD-A-BEAR WORKSHOP IS GIVING AWAY A $10 GIFT CARD. TO ENTER, POST A COMMENT ON THIS BLOG, AND THE WINNER WILL BE CHOSEN AT RANDOM AND NOTIFIED BY EMAIL. BE SURE TO INCLUDE YOUR EMAIL ADDRESS AND INDICATE THAT YOU’RE INTERESTED IN BUILD-A-BEAR WORKSHOP. Unique for combining a sincere hospitality experience in the presence of thought-provoking art, the Roger Smith Hotel of NYC is a boutique hotel with accommodations that evoke the warmth, mood, and comfort of a guest room in a special friend’s home. Artwork, potted plants, and book collections are distinct touches uncommonly seen in a New York City but found in the Roger Smith Hotel. Each of their spacious 130 rooms and suites are individually decorated in classical New England designs.The Roger Smith Hotel Accommodations and Lodging in NY. The Roger Smith Hotel offers a wide variety of hotel room accommodations and lodging, perfect for any NY traveler. Whether you are a single person traveling on business, a couple enjoying a romantic getaway, or a vacationing family visiting New York City, you will feel comfortable and welcome. Not only is the Roger Smith Hotel located in the center of New York City’s most dynamic hotel district, but it is also only minutes from classic landmarks such as Grand Central Station, The United Nations Headquarters, and the Chrysler building, all within a five block radius. Another few blocks away but still within walking distance, you’ll find the Empire State Building, Times Square, Central Park, and famous museums. Follow the hotel at http://www.Facebook.com/rogersmithhotel and http://www.twitter.com/rshotel. THE RIDE, is loads of interactive fun and a unique experience….chockful of jokes, singing, doing the wave, sightseeing and more. THE RIDE’s specially-designed custom vehicles are the tallest allowed by federal law on city streets. The bus is fitted with stadium-style seating that orients riders sideways to look through massive windows, and two on-board hosts banter comedically as they travel through the streets of midtown Manhattan, commenting on New York’s history and its iconic sites and structures, and giving insider secrets about the city – all while incorporating actors and performers along the route who interact with the vehicle and its passengers. External speakers and exterior lighting allow the on-board hosts to make everyone on the street part of the experience. Surprises show up all along the route, featuring sites from the Chrysler Building and Grand Central Terminal to Times Square and Columbus Circle. A full schedule for THE RIDE is available at experiencetheride.com. Tickets are on sale now, available three ways: online at experiencetheride.com; by phone at (866) 299-9682; and in person at THE RIDE Box office located at the New York Marriott Marquis Hotel, 1535 Broadway between 45th and 46th Streets. Join them on Facebook to get the latest news. http://www.facebook.com/ExperienceTheRide. NYC is truly one of the greatest cities in the world, and it’s so easy to take it for granted if you live here, but there’s much to enjoy if you take the time to explore and scope it out! Note: Thanks to THE RIDE, and BUILD-A-BEAR WORKSHOP for providing promotional visits. i have seen the ride about town and was wondering what it was all about. I would love to win the Build-a-Bear gift card! My son loves their selection of dogs! My e-mail is Cara@CaraMeyers.com.